What are your easiest, tastiest meals - quick to prepare when you can't think of anything!! I have a few 'standard' easy meals that I always have the ingredients handy, in case I seriously can't be bothered cooking a 'fancy' meal ....... feel free to add your own 'Favs'! 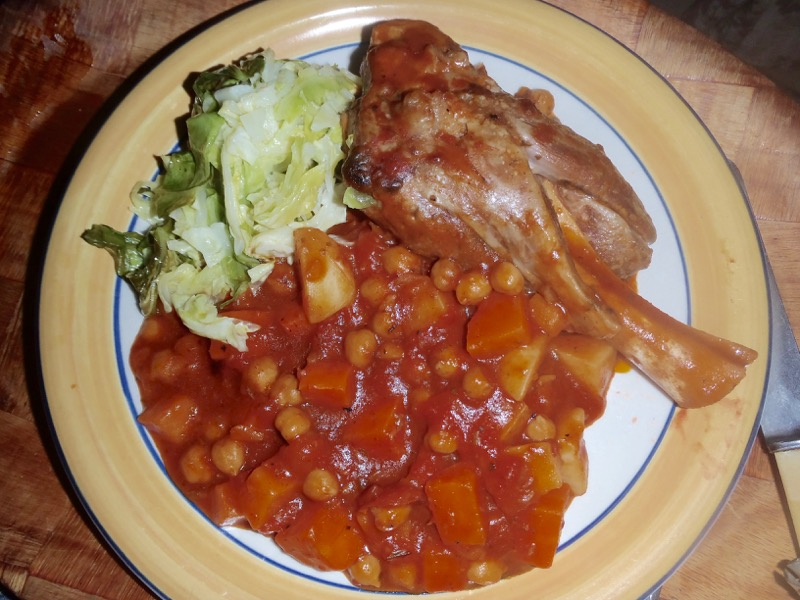 Last night, we had our winter favourite 'comfort food' - Lamb Shanks!! I cheat, and buy the Aldi FROZEN Lamb Shanks (2 for $12 already cooked - they usually cost that 'RAW'!!) - that way you can always have a couple in the freezer. I often take them with me when I am camping too - SO easy to just cook in the microwave with some sweet potato 'on the trot'! Take them out of the box and they are even easier to store in the Freezer. If you decide to cook them up later in the day - just pop them in the sink (or big container) with cold/lukewarm water & they'll thaw out pretty quickly. Change the water if you want them to defrost quicker. They come in 'individual Vac Pacs' - and because they are already Pre Cooked - when you open them, the 'cooked fat' is already 'in solid form' and you just pull it out - so they are healthier for you too!! In a BIG casserole pot, add 1 tin of diced tomato & 1 drained tin of Chickpeas. Add 1 x Cubed Potato, 1 x cubed small Sweet Potato, 1 x chopped/cubed Carrot. Mix them into the tomato/chickpeas sauce. Remove any 'solid fat' from both of the Shanks and add them to the casserole pot along with all the gravy in each pack. Mix the gravy well with the tomato mix. Cover the pot & cook at 180 degrees Celsius oven for 2-3hrs ..... stir every hour. The meat will just fall off the bone and I bet you enjoy them! BONUS: After serving up with the gravy and veggies (and cabbage or your choice of greens...) whilst the remaining gravy & veg are still hot - use a Bamix (or similar) to pulverise it all ..... this will make a wonderful soup for the next day or so! I usually water it down a bit as it can be quite thick. Lovely with some toast for lunch. One of my other favs is the 'Vac Pac'd' 'FLAT CHICKEN' .... once again, Aldi do a lovely one - with yoghurt & garlic with NO BONES - so you just cut up the chicken in slices when cooked. Just do a BIG ROAST - I do it in 2 dishes - the chicken in one (with alfoil under the chicken on a cake rack to reduce the cleaning!) and all the potato, sweet potato, pumpkin, carrot & onion in another tray, all into the oven at the same time as the chicken - and it takes a bit less than 1hr to cook at 170 degrees Celsius. Turn the chicken & veg around after 1/2 hr. Cook greens in the microwave 5 mins before serving time. This gives us 2 full sized meals for 2 for 2 nights. Once again - keep one of the chickens in the freezer - as they are 'flat' they store really easily & don't take long to defrost in the sink in cold/lukewarm water - great for when unexpected guests turn up, too. 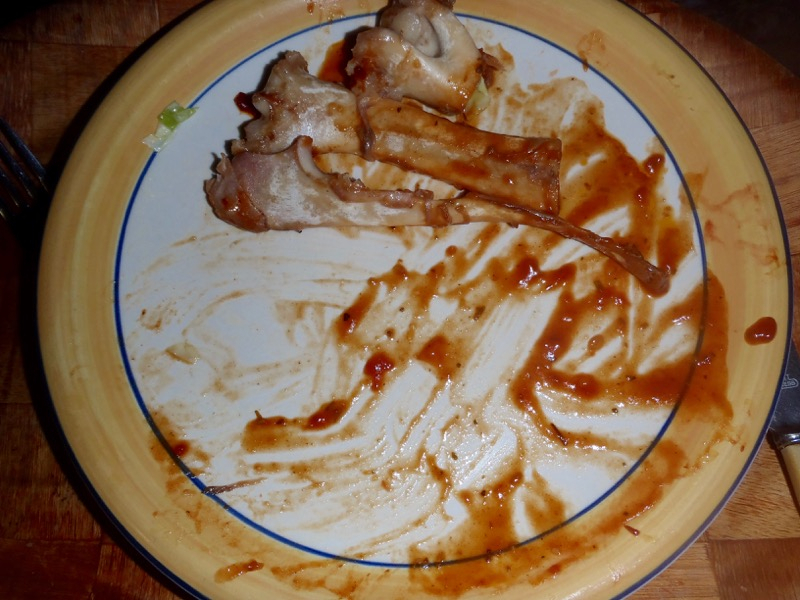 Here's the 'after pic' of my lamb shanks last night ....... just as well we don't have a dog .... nothing much left! @arpie that looks really yummy!! We love Asian food so one of my easy ones that I have all the time and we are having tonight is either a curry whether it be green, red or panang filled with tons of veggies. It’s great comfort food for me too and a way to use up some sad veggies u might have hanging around. My husband has become a dab hand at frittata - sort of a Spanish onmelette baked in the oven with capsicums purple onions and shredded ham.Is quick and easy and the aroma filling the house is amazing - my favourite.Served with. A green leaf salad. I am also addicted to bruschetta - an Italian tomatoes on toast with the toast smeared with a garlic clove instead of butter.I also add chopped purple onions , basil and black pepper and it is my favourite lunch. We also make butter chicken with diced Kent pumpkin and peas served with rice quite a bit.Thank goodness for Patak’s cook in sauces ! Makes an easy filling meal on a cold wet night. Funny we had lamb shanks in red wine last night but I had cooked them myself on wednesday . Can't think of a recipe to add but i'll think about it !! Forgot my kids favourite is chicken breast schnitzel which I crumb using Stuffing mix . I also have a great Frittata using potato that I just cube & spray with oil & bake (instead of pan frying it), then add a heap of chopped up bacon, then a heap of chopped onion and finally 6-8 eggs (beaten with Salt & pepper) depending on how many you are feeding. Cook on low heat so it doesn't burn on the bottom & if the top isn't 'cooked' - pop it under the grill for a few minutes before serving, to 'firm it up'. Lovely cold the next day too. The old 'Impossible Quiche' with grated zucchini & cheese, onion & eggs is yummy too. Tho I haven't made that one for years now! 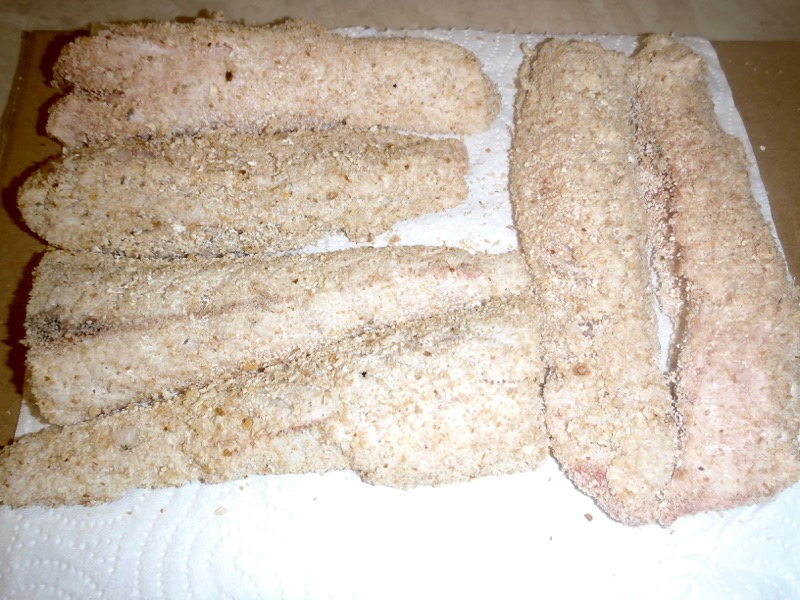 I do my own fish & chips (catch the fish & fillet & skin it & coat it in just crumbs - no egg & flour.) I do the chips as wedges & spray them with oil & bake them in the oven for about 1/2hr til cooked. Sometimes I do Sweet Potato wedges .... Yummy. This pic below is 2 fillets from a nice 50cm Flattie, cut into 3 pieces each. The one flattie will feed both of us. Gee thanks for reminding me about the impossible quiche that’s a good one.Love fresh fish but sadly not my kids so have to wait until they’re out to have it. Unfortunately I have very fussy teenagers these days so meal times can be frustrating to put it mildly. @arpie - you are one incredible and inspiring individual! I’m lying here in my warm bed imagining going out to catch, skin and fillet fish as opposed to popping down to the shops.....and wouldn’t be lying if I say there’s a much greater chance I’d pick up a yukelele! Your energy and resourcefulness seems limitless - you’re amazing!! My version of lazy macaroni cheese. Lightly saute 1 large onion, (don't let it brown at all or it goes bitter). Add 2 teaspoons minced garlic, stir through. Add 1 tin chopped tomato and 2 tablespoons tomato paste or puree. Add a few shakes of worcestershire sauce. Add about a teaspoon each of dried parsley, basil and oregano.Add half cup boiling water. ( Fresh herbs if you could be stuffed). Whack on the lid and simmer very gently. Second pot...cook macaroni till soft then drain. Add cooked noodles to sauce with about three big handfulls of grated cheddar cheese. Stir through. Very yummy but the pot is a bugger to wash.
Omg love mac ‘n cheese! The ultimate comfort food! I'm going to try that @AllyJay. Someone else can do the washing up! @arpie nothing better than fresh fish!! One of my family's fave dinners and easy as, is my super easy meatballs! Stick a pot on the stove and bring to the boil 2 x bottles of your favourite tomato passata or puree ( I use the 700g ones) + an equal amount of water. (ie empty the bottle of passata into the pot then fill the same bottle with water and add the water in). When the passata is boiling, roll the mince mixture into small balls with wet hands, and throw them in. Boil over medium heat until the sauce reduces and thickens - takes about 40 mins - leave the cover off and it will reduce quicker just make sure the mince is cooked through. So yummy with pasta or mash or veges or cauliflower mash!